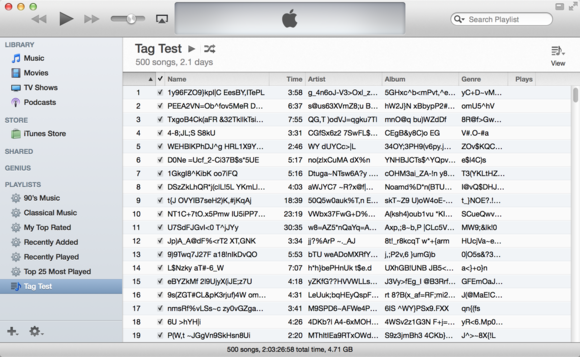 In a previous post, I looked at how to tag the media in your iTunes library. I discussed what tags were—metadata that describes your files and helps you find what you want to play. I also looked at which tags you should consider filling in for different types of music, movies, and TV shows. Now I want to show you how to clean up tags you've already applied. And what defines a “dirty” tag? Perhaps you have random characters in song names. Or maybe words are misspelled or incorrectly capitalized, or tracks attributed to the wrong artist. Such errors can make it harder to organize your library and find the media you want. These tips and tricks will help you sweep out those cobwebs. Depending on where you get your music—and no, I’m not judging you—you may have some tracks with excellent tags. In other cases, you may have tracks with incomplete information. I’ve downloaded music with titles no more helpful than Track 1, Track 2, and so on. I’ve ripped CDs and found that the best available information from Gracenote—the online database iTunes uses to fill in tags—is insufficient. I’ve gotten music tagged with extra words, names, and much more. I’m slightly tag-obsessive, but only because I want to be able to find my music when I search for it. And I use smart playlists that depend on tags. So here are some of the ways I correct these problems. I’ll start with a worst-case scenario: You have some music whose tags are gibberish. You know what the music is, but you don’t want to spend too much time playing each track and then entering the tags manually. There are a couple of apps that can help. I set up a test, with the help of Doug Adams, purveyor of Doug's AppleScripts for iTunes. Doug rolled me a custom script that replaced the main tags—Name, Artist, Album, Genre, and Year—with random characters. (For Year, it entered a random year.) The mess this script created was amazing. I took 500 tracks—some of which were popular and others less known—and ran them through Doug’s Tag Munger script. The result looks like the image below. Doug's script turned my bespoke tags into a morass of random characters. I then proceeded to process these tracks with two apps that claim to clean up tags. The first was TuneUp Media’s $40 per year (or $50 lifetime subscription) TuneUp. The second was Equinux's $30 SongGenie 2. Both did a good job figuring out what the music was, using “acoustic fingerprinting,” and applied tags to the files. TuneUp can help straigten out a badly tagged music library. TuneUp found all but 14 tracks and helpfully created playlists with both the tracks it cleaned and the tracks it couldn’t find. That makes it easy to go through the 14 remaining tracks and try to figure them out. SongGenie 2 did almost as well, finding all but 23 tracks. It didn’t make playlists, but in the SongGenie window you can see the unidentified tracks and play them. You can then manually update their tags. SongGenie, however, did worse on album names. While it found most of the song names, many of the album names were still incorrect. Both apps made mistakes on a number of tracks. For example, TuneUp thought that a recording of Bob Dylan’s “Forever Young” was 永昼 by 张韶涵, from the apparently popular album 潘朵拉. Both apps found album art, though much of it is wrong. Since many tracks can come from lots of different albums, this isn’t really a fault of the apps. They can’t know which album you got your songs from. And both apps either didn’t find genres (or found the wrong genres) for many tracks. These apps are good if you want to do a spring cleaning of your iTunes library. They can fix a lot of errors, and SongGenie can also add lyrics. But that was an extreme. You’re more likely to want to polish your tags, and there are a handful of AppleScripts (all from Doug Adams) that I use regularly to fix tags when I rip CDs or download music. When your songs don’t have track numbers, put them in a playlist and then drag them into the correct order. Run this script, and it will apply track numbers, such as 1 of 10, 2 of 10, and so on so that your albums will play in the correct order. Sometimes, tracks have tags in the format Artist – Song Name. This script puts the artist’s name in the correct tag and leaves the song name where it should be. This nifty script trims your tags, from the front or the back. 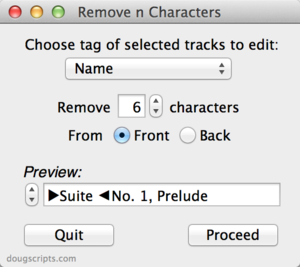 I use this script to fix tags that have extraneous information at the beginning of the name tag (composers’ names, for example), or at the end (such as [Live]). It irks me to see titles of songs such as “Beat It On Down The Line” (it should be “Beat It on Down the Line”), or “Girl From The North Country” (which should be “Girl from the North Country”). This script fixes them. Sometimes tag information is in the wrong place—the artist name is in the Album tag and the song name in the Artist tag. This script lets you swap, copy, append, or prepend data from different tags. This performs a basic find/replace for any text in all the main tags. You can, for example, replace one specific word with another or delete a word or phrase by leaving the Replace With field blank. I strongly recommend tagging your music as you rip it or when you add it to your iTunes library. This saves you a lot of time later, when you decide to fix everything at once. It only takes a minute to tag an album, and with the above tools you can make the process simpler. Keep your tags clean and you’ll find the music you want a lot more easily.